I'Alex Jones and this is infowars, the #1 Internet News Show in the World. Ladies and gentlemen, we are broadcasting here in Texas. 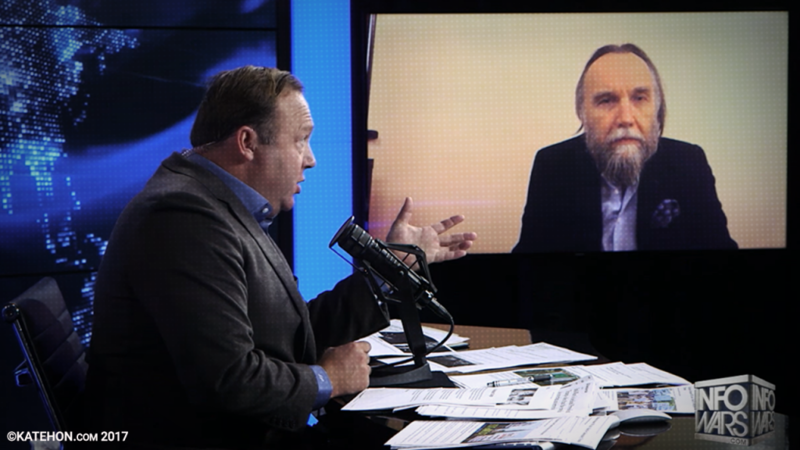 Our guest is from Moscow, Russia - Alexander Dugin. The media says that he is a top advisor to Putin. But from my research, i would say it is more like what the media says that I am telling Trump what to do. That's not what really is happening, we just looking at the same picture, the same story, the same truth, we are hearing the same historical piece of music. But, undoubtedly, doctor Alexander Dugin is one of the leading people when it comes to rebirthing Russia and rediscovering the greatness of Russia and humanity itself and creating a pro-human system. Somebody thinks that media says what he has said, but I wan him for a few minutes to tell about himself first, before we get to these big huge topics. Because I will cover what the elites believe and I will cover what some other groups believe, but then I will wake up in the morning and newspapers will say "Alex Jones believes XYZ" and it's not true. So, it's better to directly hear from someone telling you what they actually believe in, in what he believes Putin believes in. And a type if the world system I am trying to create versus what they are trying versus what the globalists are trying to create. One of the topics he want to get in for is post-globalism. Make no mistake - we are post this form of corporate global government. They are in major retreat. I'll use the analogy with the 1945 Germany few months before the final fall, when you know the Nazis are going to fall, but the question is: "How long will this go on?". The globalists are very similar to Nazis. The problem is - what are they going to do to try to keep power? Well, Soros has doubled the amount of money for riots, they are training people in universities now, that are planning something big. In whole next hour I'll try to just sit back and let our guest speak. So, doctor, thank you so much for coming. I want to spin just a few minutes on you, what you are really stand for, what you really believe, all the big movement you have launched. Who you think Putin really is and who do you think Trump is in this new multipolar world? - Thank you, Alex, for your kind presentation. I would like to express my ideas concerning what is going on in the world with the new agenda for the US with Mr. Trump, who I support with all my heart, and what is going to happen with Russia and with Mr. Putin, who I also support with all my heart. Mr. Putin and I, we defend the same position, we share the same concerns, we love our people. It is the same agenda that I hope Mr. Trump shares as well. And we all are blamed. It is not because we are bad or extremists, but it is because of our values and position. In my book The Fourth Political Theory, I criticize three political theories. I am against liberalism, against globalism, and I am against communism. I am a traditionalist and Christian. I was a dissident in Soviet times because I never shared the conventions of communism, I didn’t accept this illness. I am anti-communist and at the same time I am anti-Nazi, anti-fascist. I don't share this neo-racism. I am always standing on the same thing - I belong to the fourth political theory and when the liberal media tries to present me as an extremist or communist, that is an absolute lie. - But first, can you tell us why Vladimir Putin is so popular in Russia and around the world? What does he really stand for? - My introduction was important because I would like to stress that I am simply a realist like you, Alex, and like Mr. Trump or Mr. Putin. Realism doesn’t mean nationalism. Realism doesn’t mean any ideology. Realism is considering the sovereignty of people and nations as the highest value. And that is a completely anti-globalist agenda. - Exactly! Trump is a known realist. We should celebrate sovereignty and nationalism and work together and not try to conquer each other. This is just common sense. This is a human right to resist our common enemy, the globalists, is it not? - Absolutely. And national sovereignty is very important there. It defends identities. Identities can be different. They can coincide or not. But this does not mean necessarily war on a country. We can accept your differences in a positive way. Americans and Russians are different, Europeans and Americans and Russians are different. The globalists are trying to make a kind of pacifist dream by killing countries, killing differences. We need to affirm our identities and that is the way of understanding each other. That is Putin`s position as well. He is not imperialist. He is not a fanatic. We are in a situation when there is no more hostility in our countries. I used to be anti-Americanist during the tenure of Obama or Bush not because I don’t like Americans. I love America, but I hate the globalist's agenda. Everybody in Russia has to understand that America was highjacked by a globalist sect. But now Trump is restoring American dignity. And we stopped immediately to hate America because it is not Americans who we hated before - It was the globalist elite. Globalism is the problem of every country and every person. Russians as well are under attack by globalism. We need to be united. I believe that great “multipolarity” can lead to cooperation of our countries and our people. But we need to fight against our common enemies. We have to deal with Mr. Soros, who tried to overthrow our governments and tries to create a color revolution in our countries. You need to understand that Russia is no longer a communist country. We can’t apply old Cold War models. Russia is a traditional, Christian country just as well as America is. And radical Islam, supported by globalists, is our common enemy. What is also important about Russia is that we are hearing the voice of the people who are dying for our freedom and our security. I think it is necessary to hear what people from the army say. We are losing our guys fighting against radical Islamists. - One of the liberal politicians criticized Putin for invading Ukraine but she couldn't even remember the exact name of the country and actually blamed Putin for invading Korea. How do we deal with the leadership that is this wracked in mind? - This is a good example of how globalists understand the world. North Korea, Ukraine or Aleppo is the same for them. It is all virtual for them. They are sending American people to die without any understanding of the situation. For them - it’s a game. They have no responsibility for the people. They don’t understand history. They don’t know geography. And they are speaking about Putin and Korea. That shows their knowledge about Russia, about Putin, and how deep they understand the geopolitical world. That is characteristic for globalists. They have a huge lack of culture because they are against any culture. We need to make our strategy an educational one. Only with a very uneducated and stupid audience can globalists reach their goal. But now, Americans have shown that they are not such idiots like the globalists were thinking. Americans have chosen what they want. It is time to think about the future. The globalists remind me of the black periods of Soviet history - Stalin`s style of lie. They are trying to impose their order and ignoring the position of the others. Now, we can fight together. The future world should be based on this defense of information and identity, and religions. And we, Russians, want nothing more; we don’t want to occupy anybody. We need to secure our boarders, that’s all. We are trying to create a Christian society accepting and respecting minorities. And we are demonized exactly because it works. The globalists tried to convince the world that “Putin has helped Trump” to win election with all these stupid stories about hacking and so on…But Putin really has helped Trump by showing an example how to defend realist values. -Exactly! Russia is an example of pulling out globalism and I salute you for that. - Absolutely. But I think that now the situation has a little bit changed. This is very important for human history. Now, the initiative of those who are changing the world is once more in the hands of Americans, in the hands of President Trump. Russia has made a kind of introduction to future multipolarity. But now everything depends on the US and on President Trump. He is capable of saving people all around the world from globalism and he has already begun this really spiritual fight. America is a leader in this world. After Brexit and after Trump's Presidential election, it is a turning point in history. I think that the initiative belongs to you and you need to make all efforts because you are in the best situation. And I think you need to concentrate on the vision of the future. -Alexander, what are some of the best websites for people to visit to know more about your books? - I think, 4pt.su is dedicated to my fourth political theory. Also, there are many texts in English on Katehon.com. Some of my books concerning 4th political theory, a book about Heidegger, and a book on Putin`s geopolitics have been published in America. There are many other books that are now translated into English. When people read my books, they may have an opposite view, but I think it is very important to discuss issues from different positions. We need to try to open new perspectives. -The lefts claim that they are progressive, but they are progressive like a cancer. - Exactly. The cancer is the right name for globalization. They try to repeat the same order, the same agenda, politics, and the same hyper-individualistic attitude towards human nature.They destroy the differences, they destroy the richness of humankind. - Can you tell about the concept of the swamp? - The swamp appears to be a kind of war. It is a new political form which is the same as the globalist system. It tries to destroy every country. The swamp is absolutely anti-democratic. And now the swamp has found the word to attack us traditionalists. They call us populists. Now they understand that they can’t use the terms “fascist” or “communist” because it is ridiculous. And they are standing against populism. - But what is bad in being populist? Populism means the people! - Now, their nature is clear. They hate all people. They are against Americans, Russians, as well as Israelis, and want to destroy any sovereign country. Trump now is changing the direction of hundreds of years of the American imperialist tradition. America won the world but lost itself. The most important mission on the global stage now is in the hands of Donald Trump. It is wrong to consider Trump to be pro-Russian or pro-Putin. He is pro-American, he is a patriot, and he cares only about his own country. For Trump, as for Putin, national interests are in the first place. - Now we have a new anti-globalist administration. Do you think it is possible for America and Russia to work together? - I think our relations are already much better. Anti-Americanism in our country has vanished. Our leaders together can make our countries great again.